Brijesh Damani, Malkeet Singh starrer team CITY KNIGHTS has won the 3rd edition of Bengal Premier League held at The Silver Spring Club, Kolkata. City Knights defeated Dream Chasers lead by Kamal Chawla and Divya Sharma 4-3 in the scintillating decider. Last night four teams qualified for the knockout stage where Dream Chasers topped the points tally followed by City Knights, Cue Magicians and Green Warrior. For knockouts Dream Chasers played City Knights in the semi finals and defeated them almost in one-sided affair 4-1. Because of that lose, City Knights played one more match against Cue Magicians who had earlier defeated Green Warrior in another semi-final. 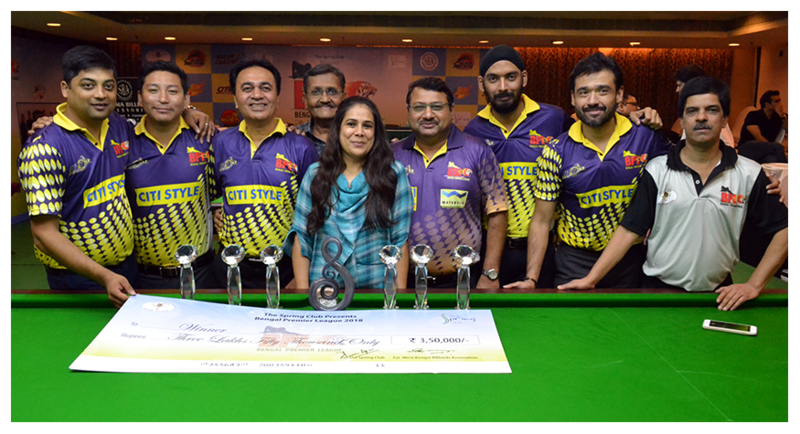 In that match City Knights knocked out Cue Magicians 4-2 to get berth for final. Though Cue Magicians gave a good start but failed to maintain that tempo and lost. For City Knights, the start of final was not very good as their both marquee players, Brijesh and Malkeet, lost first two frames. However, they both controlled the situation well and won next two Doubles frame with their partners as Wangchuk Bhutia with Brijesh and Shyam Jagtiani with Malkeet Singh. At level score, City Knights local flavor and former National Champion Shyam Jagtiani took the guard and defeated Siddharth Casyab in sixth frame keep the team’s hope alive. In the deciding frame, Dream Chaser’s Kamal Chawla and Divya Sharma got initial chances but they failed to convert them in to big score. They struggled and missed the shots quite often, which Brijesh and Malkeet capitalized and kept scoring. The last miss by Divya on green ball was crucial as Brijesh and Malkeet shown great potting skills and potted till the pink to win the league. Faisal Khan of Shooting Stars got highest break award for scoring 99 in Singles Marquee category, Manan Chandra and Manish Jain got highest break prize for their break of 96 in doubles category and Shoaib Khan for his break of 64 in Local Players category. 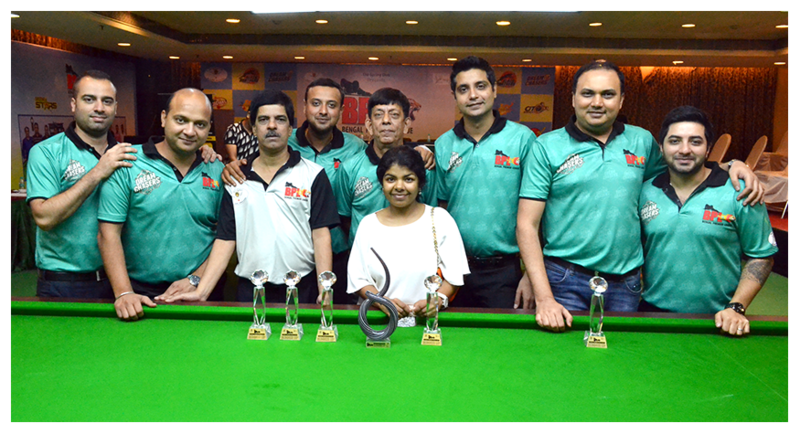 Shyam Jagtiani was adjudged as Player of the League.